A sparkling cameo from Heinrich Klaasen helped the Proteas chase 202 in 28 overs. A brilliant comeback from South Africa, resplendent in pink to raise money for the Breast Cancer Clinic at the Charlotte Maxeke Johannesburg Academic Hospital, ensured they maintained their unbeaten record on the commemorative day, and ensured the series remained alive as it heads into it’s fifth game, India leading 3-1. After losing the toss and being inserted, it was South Africa’s bowlers who began their recovery, after initially being put under the pump by a pair of increasingly familiar faces. For a while, it seemed that all that had changed for South Africa was the colour of their kit, as Virat Kohli and Shikhar Dhawan once again put on a partnership of note after the early loss of Rohit Sharma, caught and bowled by Kagiso Rabada. After Kohli’s stellar series – two player of the match awards, two centuries, and just one dismissal before today – his removal for 75, driving Chris Morris on the up to David Miller, seemed something of a victory for the Proteas, especially since he had continued to look in sparkling form. He again rotated the strike at will, but this time looked to launch earlier than he had done in his previous three innings – he was only 25 when he waltzed down and deposited a Lungi Ndidi length ball back over the bowler’s head for six. 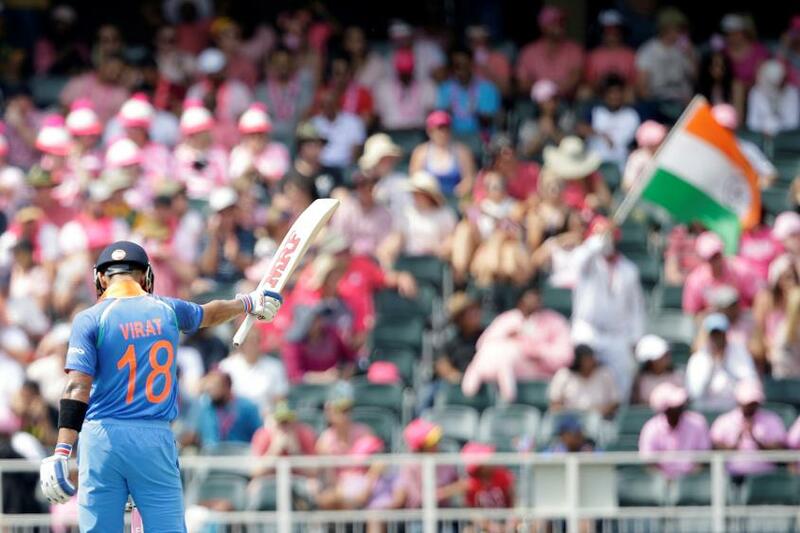 India were still ominously placed when he departed, sitting at 178/2 with 18.5 overs left to bat, and with Dhawan continuing on to a superb, run-a-ball hundred – the first Indian to do so in his 100th ODI – and Ajinkya Rahane looking initially fluent, they harboured hopes of a score in the region of 350. How to celebrate 100 ODIs? With 💯, of course! A break in play also broke their momentum however, a lightning storm near the ground sending the players and officials scurrying. Dhawan was the first to fall, chipping to mid-off just seven balls after the resumption, with Rahane following an over later, and from then on it was a scrap. India’s hopes of a big score rested almost entirely on the shoulders of Hardik Pandya, and it made captain Aiden Markaram’s catch vital as well as breath-taking, as he timed his leap at cover perfectly, plucking a miscue at full stretch. 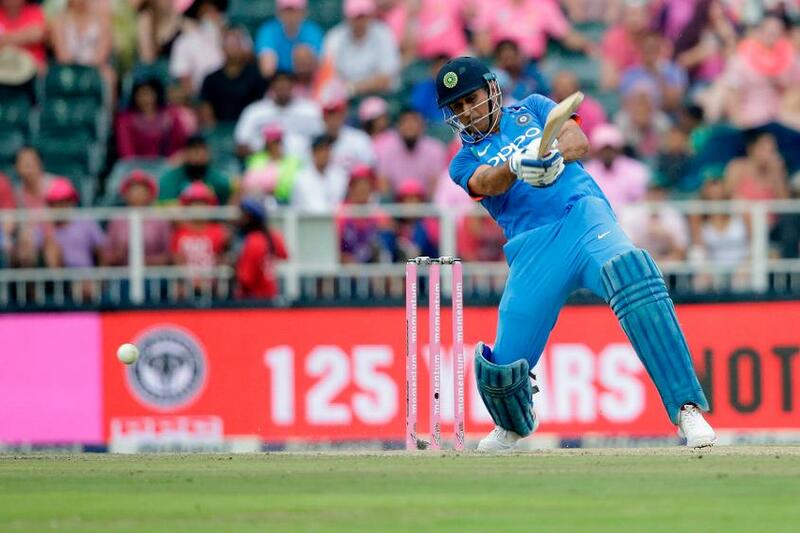 MS Dhoni’s 42 ensured India batted through, but coming at less than a run a ball it was hardly the big finish they desired. South Africa’s reply began well, Markram and Hashim Amla adding 43 at a good rate before the former misread Jasprit Bumrah’s length and was pinned in front, with a review going in vain. The dismissal came on the stroke of a second break in play, this time for rain. The adjusted target, leaving South Africa to chase a further 159 in 21 overs suited a side with big hitters AB de Villiers, David Miller, and Chris Morris in their ranks. But though the first two did play good hands, making 26 and 39 respectively, Heinrich Klaasen, who played with the experience of someone in their 200th ODI rather than their second, ensured the third wouldn’t be needed. With no choice but to attack, South Africa finally found success against India’s wrist-spinners, and Klaasen’s foray across to the off side, swiping a would-be wide over square leg for four, was the highlight of their adventurous approach. It was an error-strewn display by India’s hitherto-flawless pair of Yuzvendra Chahal and Kuldeep Yadav, especially the former, who overstepped twice, the first reprieving Miller when he was just seven, and the second costing a further six runs from the free hit. There were wides as well, and several misfields. India might well rue the two breaks in play, both of which benefitted South Africa, but the real reasons for their loss came closer to home. Chahal eventually removed Miller, but with South Africa having added 68 since that pivotal no ball the game was almost gone, the Proteas needing just 28 from 26 balls. And then all of a sudden it was finished, Andile Phehlukwayo smashing an absurd 23 from just five balls to finish the game with two and a half overs to spare. The victory means that South Africa still have a chance of levelling the series, the scoreline standing at 3-1 heading into the fifth and penultimate game.